This image is from the feasibility study released last year. The consultancy Steer Davies Gleave is conducting the survey for the McLaren Engineering Group. The survey asks about how often people travel to downtown Albany, how they get there, what they do there. And then it proposes a series of tradeoffs -- both time and price -- between transportation options and the proposed gondola. The answers will be folded into a model to help determine what sort of demand there might be for the gondola. Representatives will also be around downtown Albany this week handing out postcards with info about the survey. And people taking the survey will be eligible for a $100 cash prize if they're willing to share their contact info at the end of the survey. The headlining purpose of the gondola would be to provide an easy link between the train station and downtown Albany. But some of the survey questions appear to hint at the possibility the backers are also thinking about the gondola as a way to link the Empire State Plaza (and other spots downtown) to parking/commuting across the river. Example: One of the survey questions how much people would be willing to pay for an unlimited monthly gondola pass. And that idea makes some sense. Even though Albany-Rensselaer gets something like 800k passengers a year, it's probably a stretch to think that train station traffic alone could sustain the gondola. Having a daily stream of commuters could significantly boost ridership. And if you work at/near the ESP, the prospect of an available parking spot with a heated 5-7 minute ride into the ESP complex could be appealing. The Capital District Transportation Authority's (CDTA's) Rensselaer Rail Station is Amtrak's 9th busiest intermodal rail facility, utilized by over eight hundred thousand people per year. There is heavy reliance on the use of automobiles to cross over the Hudson River to travel between the cities of Rensselaer and Albany, New York. This survey is part of a current study regarding a potential Capital District Gondola - an aerial ropeway transportation system with three stations, connecting the CDTA Rensselaer Rail Station with Downtown Albany and the Empire State Plaza. This proposed system would be primarily funded by private funds. The proposed system would consist of a one-mile long steel cable supported by fourteen towers, carrying four dozen comfortable cabins, which arrive at stations every 12 seconds to transport passengers to and from destinations in 3-7 minutes depending on your trip. Plans call for the gondola to operate 16 hours a day at a capacity rate of 3,000 passengers per hour. 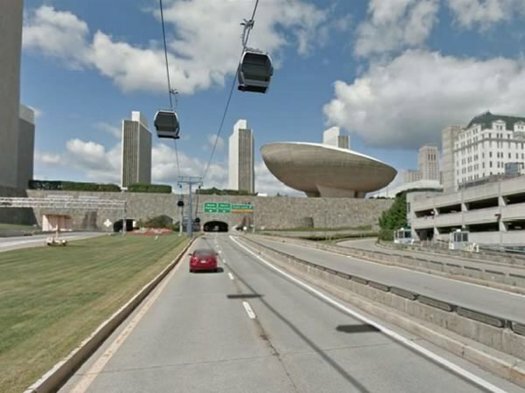 The Gondola will travel from the Albany-Rensselaer Rail Station to the Empire State Plaza, with one intermediate landing in proximity to the Times Union Center. These locations can be seen in the image below. When McLaren released the first feasibility study last year, it pegged the phase one construction budget at $17-$20 million, wit annual operating costs of approximately $2.4 million. * It's pretty clear the codes are being used to track how people find the survey. Steer Davies Gleave contacted us last week about the survey because it heard from local officials that AOA's crowd is interested in these sorts of topics. (They're not wrong.) So we got an early heads up it would be arriving this week (and probably how we ended up with our own code). We are not being compensated in any way for posting about it. Just like so many other ideas for Albany, the survey seemed to forget that people do live in the city and it's not only folks who work in Albany or come for major events. I realize the study is about a mode of transport to & from the train station, but they should think about talking to people who live there. There's enough stuff over downtown already in the form of highway ramps. I like the idea of the gondola being another commuting option as well. Could see Rensselaer/East greenbush residents parking at the station on commuting onward from there. My trebuchet and net proposal is far more economical. This seems like the biggest waste of money in the history of Albany. I used to laugh at this but the more I think about it, the more I think it's a novel and not bad idea. We've spent money on far more embarrassing (and expensive) things in our history as both a city and state. I think it could be great for Rensselaer...the city, not just the train station. I agree with Jeff D. The survey wasn't really designed for people who already live in Albany, and I definitely think we should think about it as a way for locals to commute from home to work rather than just a pod that allows legislators to get from NYC to Albany without ever having to put their feet on the ground. A Gondola. Great idea. It doesn't compete with other forms of transportation. It has the carrying capacity of a train system. It takes off every minute--so no scheduling required. It is "relatively" inexpensive, and it can improve our lives. Gondolas only seem crazy because people aren't familiar with them, but cable propulsion has been around for a very long time and has a good track record. It makes sense in complicated geographies and where average travel time are more important than top travel speeds. It might make sense in this application if there is a significant demand. Which of course is what the study is about. If there's no demand then by all means, troll away. But maybe we should see first. It is always so, so disappointing how resistant the Region is to change. And how binary the thinking seems to be...IMO the gondola is not a :"right or wrong" choice, it is about will it add to the convenience of its residents, will it help the tourists? will it make attending a college/university easier? help the business traveler arriving at Amtrak get to her meeting? will it allow us to leave the car in the driveway or accommodate those without a car (or without a driver's license) Will it provide Albany an element to the skyline----? And if the intercity bus services moved adjacent to Amtrak, that would also help establish a true intermodal transportation hub and increase gondola ridershipl. I think it's a great idea. I work in downtown Albany and often travel to the city via Amtrak and have clients come in that way. It would be much better/easier and frankly more interesting to take a gondola ride. I think it would be a cool introduction to the city and a bit of a tourist draw similar to the bridge over the Hudson in Poughkeepsie. Please use these funds for something that adds value to our community - support of the arts, education, small business, green spaces - ANYTHING but this utter waste of tax dollars! This glorified amusement park ride is a huge liability! Improving transportation to the Rail Station could begin with disallowing a single transportation service to GOUGE consumers. Let's improve CDTA and make that more convenient to travelers. Have you ever tried to take a bus to catch a train or plane? It's a ridiculous level of inconvenience. Look at how long it took the region to accept Lyft + Uber as potential solutions. Surely, we think long and hard about some things, and others, not so much. This type of "solution" makes me wonder if we should work on hot air balloons over the river? Imagine if a mixed use development - apartments, townhouses, restaurants, offices, a park - were built on the Rensselaer riverfront, and people on both sides could go to work and go out in either Albany or Renss, just by walking to a gondola station? If people had reason to traverse the Hudson - in both directions - for a reason other than commuting or getting to/from the train station, a gondola could be an awesome (and financially self-sustaining) idea, that also cuts down on the need for parking. How are we coming on developing the Renss waterfront? Also seems unfair to ask the City of Rensselaer to become a giant parking lot so people don't have to pay for parking in downtown Albany (where hardly anyone lives, and people moving in are higher income). Caroline Isachsen (above) is so right.This is a breathtakingly stupid idea, and shows just how totally out of touch this city's government is with the needs of its residents. I can't believe it's actually getting any serious traction. Let's get our priorities straight. This city is falling apart; installing a merry-go-round isn't going to help. I agree with Ben's comment above. I'd love to see something on that cleared brown spot at the Rensselaer riverfront! And if I could hop a gondola ride (preferably an inexpensive one) to get there? Fabulous! Low Priority. Better to improve the ground transportation to the station- a limited light electric rail shuttle perhaps. Folks realize that this is a private proposal, right? That the city is responding "sure, show us what you got." At this point it's not at all publicly financed. The companies that manufacture these systems, Bombardier, Dopplemyr, for example, have reached a saturation point for they're most common uses. Ski areas don't constantly renew their gondolas, so a one time buy from a place like Gore, for example, is a one shot deal. Second, because of shorter ski seasons and lower snowfall totals, the margins are so thin that mountains are hesitant to make the leap to gondola systems. As such you have these large manufacturers realizing their market is drying up. So what to do? This is the tip of the iceberg. When oil prices start to rise again, and they will, we're going to see more and more of these proposals cropping up. Second, if this does get public funds, it's not going to come from the school budget or water and sewer funds. It amazes me that adults don't have any idea that most funding lines cannot be co-mingled co-opted. Different sources, different uses. IF this does get any funds it will be transportation funding, funding that may be well deserved it this has a benefit to air quality (reduction of tailpipe emissions) impervious surfaces (lessens burden on creating more parking lots) and there's a benefit to potential commuters in shorter travel times. Good point, daleyplanit. Private companies do have some inherent bias that is worth keeping in mind. It doesn't mean that their findings would be invalid, but it does mean that when the city reviews the findings, examining the methodology of the study is worth the extra time. We need better transportation around Albany. It takes 1 and half hours to get from Albany to Troy by bus and an hour to get from downtown Albany to Colonie. That should be bigger priority. Fortunately Alycia, the people conducting the study are not the same people as those who should have this bigger priority as you suggest. A total waste of money. Invest in downtown Albany instead. It needs more help. BUT there are signs of life in the capital city. Thank the fates.